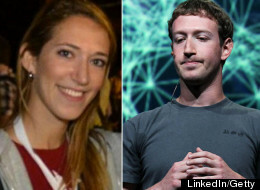 Arielle Zuckerberg, Facebook CEO’s Sister, Now Works For Google…Awkward! Google recently acquired Wildfire Interactive Inc., an advertising startup that specializes in working with social networking sites. Wildfire also just so happens to be one of Facebook’s leading marketing partners. While this new match may make for some strained business interactions, it might make things even more uncomfortable when Facebook CEO Mark Zuckerberg and his siblings sit down to their next family dinner.One of Zuck’s younger sisters, Arielle, is a junior product manager for Wildfire and will now presumably be employed by Google, which last year placed itself in direct competition with Facebook when it launched social network Google+. Arielle Zuckerberg has been with the marketing software startup since her graduation from Claremont McKenna College in 2011, per her LinkedIn profile. According to Business Insider, another of Mark Zuckerberg’s sisters, Donna, is married to Wildfire product strategist Harry Schmidt. This means that two members of the Zuckerberg clan will be Google employees. So far, the family seems to be making light of the situation. On Tuesday, the eldest Zuckerberg, Randi, tweeted warm wishes to her relatives: “Congrats Wildfire! There are officially now more Zuckerberg family members working for Google than Facebook! #awkward ;).” Randi previously worked for Facebook before becoming aproducer for Bravo’s reality TV show Silicon Valley. Imagine this: When you are on going through your Facebook wall, you note that some of your friends have uploaded a link to an application that claims to reveal who visits your profile and how famous you are, just by clicking on it. However, when you realize that this seemingly innocuous activity might provide a gateway to a remote hacker into your own computer, it is too late. According to the findings of Internet Security Threat Report by a private computer security firm, social networking sites are increasingly used to launch malware attacks in India. The report highlights that the users feel comparatively safe to surf social networking sites compared to unknown websites. “The very nature of these networking sites makes users incorrectly assume that they are not at risk and attackers won’t use these sites to target new victims. Due to social engineering techniques and the viral nature of social networks, it’s much easier for threats to spread from one person to the next,” said Anand Naik, managing director (India), Symantec. Neha Gupta, senior research analyst at Gartner, estimates more than 1 billion people worldwide will use social networks in 2012, but not just for social streams on sites like Facebook and Google+. Gaming revenue from social media more than doubled between 2010 and 2011 and is expected to reach $6.2 billion in 2012. Some social developers, such as Zynga, GREE and DeNA, have moved to an open-platform strategy to support user convenience and choice. Along with the developers move, marketers are allocating a higher percentage of their advertising budget to social networking sites. Not just traditional social sites like Facebook, but video services. Social networking sites bring people with common interests together, offer exposure to new ideas from around the world, and lower inhibitions to overcome social anxiety. People who have a difficulty communicating in person are more comfortable interacting via the Internet. 60 million Americans received help with major life issues (975 KB)  (changing jobs, finding a new place to live, buying a car, and caring for someone with an illness) from people in their social networks in 2006. These people said social networking sites helped them connect with friends and experts who assisted in their decisions.